I'm happy to say the bedroom redecoration project is nearly finished. Here you can see what the room looked like before...it actually had a self-stick border of dump trucks and bulldozers on the middle of the wall the whole time Brian used the room. Once I took that off, I was left with white on the top and green sponge painting on the bottom. And here it is with the new paint on the walls. The green is actually very pretty and really brightens up the room. As you can see my Wiggly Whimsy is on the wall in there now. It's nice to finally have a place to show it off. And the bright colors really go well in there too. This is a panel mom had gotten for me. It's another quilt I'm happy to finally have hanging up instead of being folded up in a drawer. I used the one wall to hang up three canvases...I made the top two and Emily made the bottom one. And this is the afghan mom gave me after she saw the curtain fabric I had bought. It's perfect in this room and I just love it! The yellow in it made me decide to add yellow to the quilt I'm making. And speaking of that, here are the first two blocks on the design wall. I have a third nine-patch made now, all ready to be cut up and resewn. Hopefully I can get to some more sewing here before the day's over. It sure looks different in a good way. 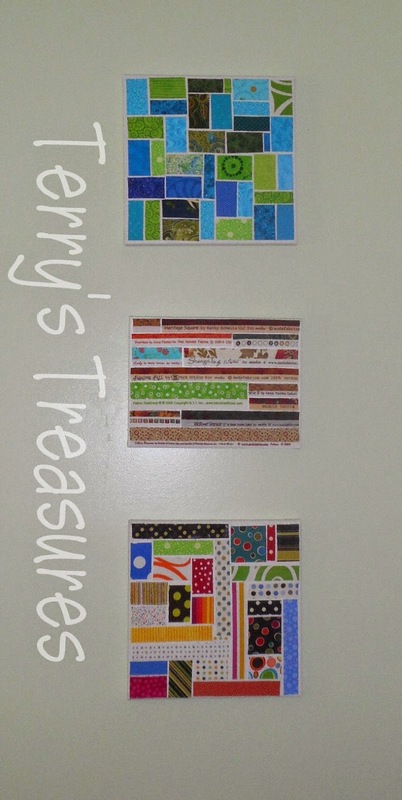 Love all the things on the walls and the quilt blocks are coming along nicely. Great room. Wow - what a great transformation! Opens it up and adds such warmth. Looks great Terry! So bright and cheerful. Wow, wonderful transformation. Your quilts look brilliant with the green. There are so many things I love about this room makeover. Everything actually, from the wall color, the quilt hanging on the wall, the quilt currently on the bed, the afghan, the quilt that it is the works. Great job, Terry. Wow! What difference! This room is so pretty and welcoming. How nice to have a place to show off some of your beautiful quilts. The room looks wonderful! So cheerful and bright. 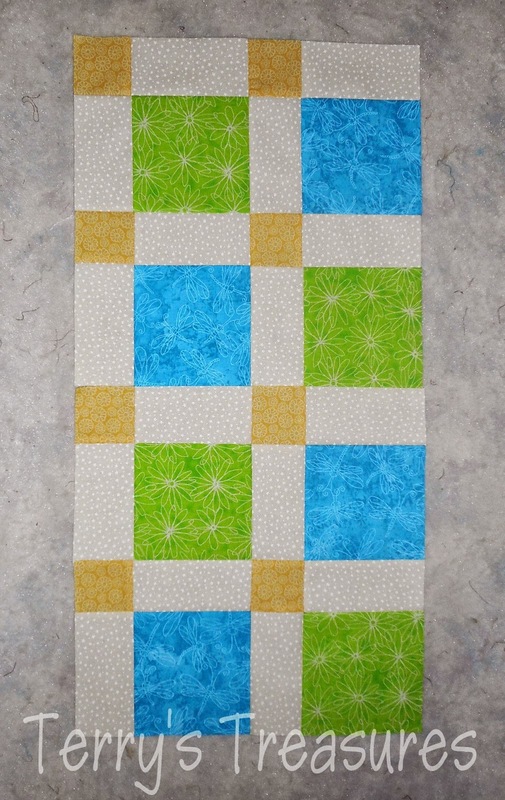 Love the newest quilt - you can't go wrong adding yellow to any quilt -IMHO! Wow. I love it! Looks much nicer. You go, girl. What a wonderful bright cheery room!! Great job! Have an awesome day!! WOW!! Looks wonderful and so inviting!! 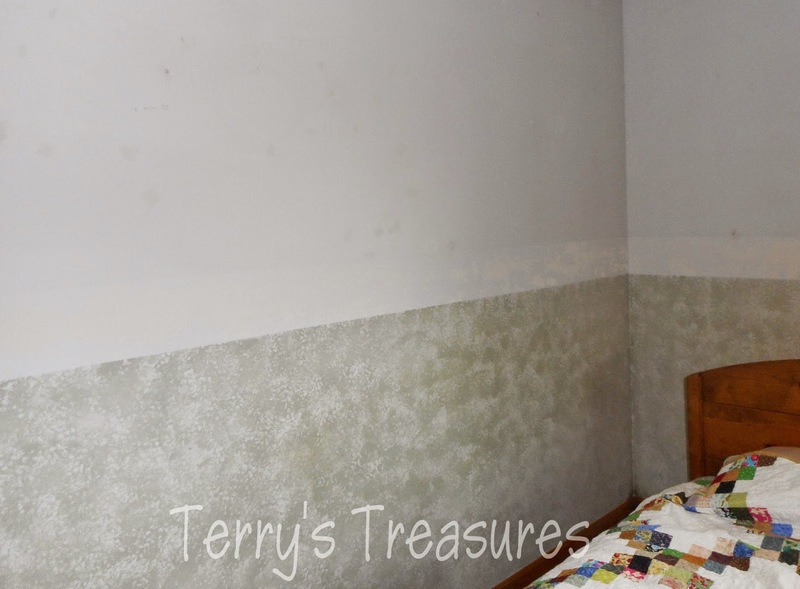 Your room looks so good Terry...all the little details is wonderful. Your bedroom looks great. Is it a guest room? 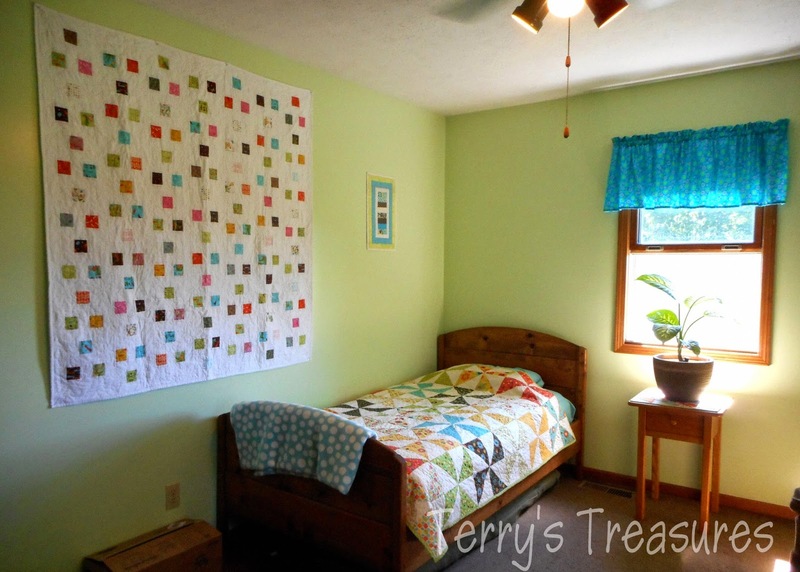 Love your Wiggly Whimsy quilt on the wall. Your colors look wonderful! All bright and cheerful! That afghan looks like Forget-me-Nots. Very pretty! Very pretty room! my sewing room paint is close to that green! Your new room looks great as do your quilts. Nice job! What a transformation! 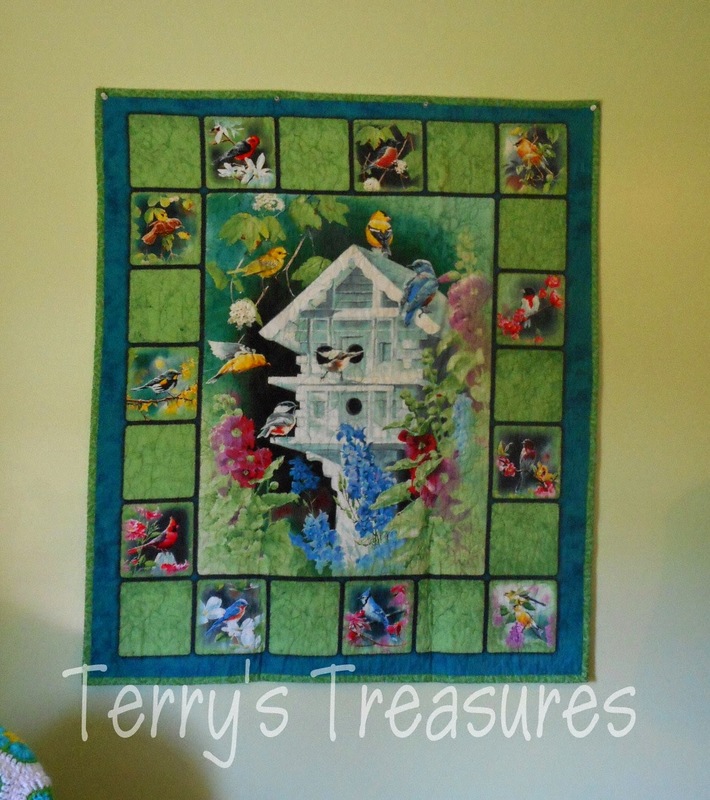 It looks wonderful and I love how you have decorated it with your quilts and your mom's afghan. Beautiful and inviting! That sure turned out great. Love all the creativity hanging on the walls and in the chair and just everywhere. The colors are happy happy happy!!! Love how the room turned out. The room looks great! Love the green walls, it pairs nicely with the wood furnitures and the pinwheel quilt. Lovely!! your room is wonderful...love the colors and especially the quilts! !